Washington: Bikram Choudhury, the flamboyant Beverly Hills-based yoga guru to the rich and famous, has been sued by a San Francisco nonprofit organisation of yoga enthusiasts challenging his claim of copyrighted poses. Seeking to disprove Pakistan President Pervez Musharraf’s claim that the USA had not given him convincing proof about nuclear proliferation activities, the State Department has said that it provided “pieces of information” from time to time as part of the dialogue on the issue. 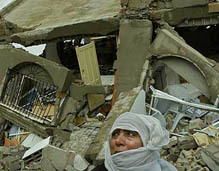 At least 13 Palestinians were killed and over 50 injured today in gunbattles with Israeli troops in the Gaza Strip. The gunbattles were described by the army as operations to check Kassam rocket attacks on Jewish settlements and unearth tunnels used for smuggling weapons. 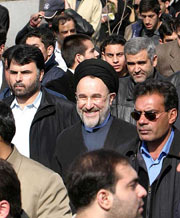 Iranian President Mohammad Khatami walks with the people during a demonstration at Teheran’s Azadi Square on Wednesday. Khatami warned his hardline opponents that they were turning young Iranians against religion and the Islamic Republic founded by Ayatollah Ruhollah Khomeini exactly 25 years ago. 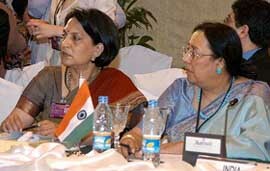 Extending support to the “composite” dialogue initiated by India and Pakistan to resolve their differences, speakers at a seminar here urged Prime Minister Atal Bihari Vajpayee and Pakistani President General Pervez Musharraf to take it to its logical conclusion. Israel is favourably inclined towards providing India with high-resolution pictures of Kashmir from its photoreconnaissance Ofeq-5 satellites. In a major relief to immigrant workers in Dubai, the UAE has scrapped the law requiring foreigners on visitor visas to exit the country to re-enter on work visas. Mughal treasures brought to the UK by Robert Clive, a British commander during the Raj, are expected to fetch about £ 1.1 million when they are sold on April 27, auctioneers Christie’s said today. Born in Calcutta, Mr. Choudhury opened one of his first yoga schools in San Francisco in 1973. There are now close to 900 Bikram Yoga studios around the world. He copyrighted, trademarked and franchised his poses, breathing techniques and dialogue, creating the first yoga chain. Mr Choudhury’s lawyers responded with a letter saying the plaintiff was infringing on his trademarks by “mixing Bikram yoga with other yoga styles to create your own blend, by teaching others to become Bikram yoga teachers, by using teachers who have not been certified by Bikram, by teaching classes without the complete dialogue.” The suit is asking the judge to determine whether Mr. Choudhury is entitled to copyright and trademark his material under federal copyright laws. A trial date has been set for next February. Mr Choudhury’s lawyers have sent out over 100 “cease and desist” letters to Bikram yoga studios and teachers, accusing them of violating his copyright and trademark by employing instructors that weren’t trained by the guru. Mr. Choudhury’s training programme costs $5,000 per person. His letters threaten a penalty of $150,000 per infringement. Last July, Mr. Choudhury won a copyright infringement suit against the owners of a southern California yoga studio. 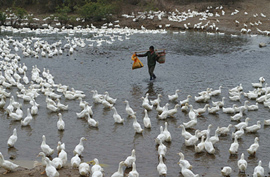 Under the settlement, the operators agreed to pay him an undisclosed sum and never again teach Bikram-style yoga. Yoga has become big business in the U.S. attracting an estimated 18 million practitioners and accounting for $27 billion in annual sales, according to Yoga Journal. In the earlier lawsuit, Mr. Choudhury and his wife, Rajashree Choudhury, asserted claims for copyright infringement, trademark infringement, violation of rights of publicity, and other related causes of action, and sought to permanently enjoin the defendants from such conduct. Under a settlement reached in that case the defendants agreed to the payment of compensation to the Choudhurys and to never again use or otherwise infringe upon Mr Choudhury’s copyrighted works. “We have talked at different moments about issues that might have arisen that we might have learned about. So it is not a single moment of information”, State Department spokesman Richard Boucher said yesterday. Twelve Palestinians were killed and more than 40 wounded in the Shajaiyeh neighbourhood of Gaza City in a fierce gunfight that started before dawn and continued throughout the day. Arafat’s Fatah faction in Gaza, media reports here said. The firefight ensued following massive parallel pre-dawn incursions near Natzarim and Kibbutz Nahal Oz in the Gaza strip, and further south near Rafah. An Israeli military spokesman said the army had identified “at least 17 hits”, adding that all those targeted were armed with explosive devices or anti-tank missiles. In a separate incident in the Rafah area, along the Gaza-Egypt border, Israeli troops killed a Palestinian and injured nine others as they continued their operation to find tunnels booby-trapped with explosives. The army said the tunnels in the area had been used for smuggling weapons. For the talks to be successful, they said at a seminar on Kashmir, it was necessary for the USA to remain engaged in the process but were divided whether the UN should have any role. The seminar was organised by the pro-independence Kashmir American Council and the Association of Humanitarian Lawyers. Former adviser to the UN Secretary-General M. Yusuf Buch, who was born in Srinagar and now is US citizen, said the most important aspect was to select representatives of the people of Jammu and Kashmir who would negotiate with India and Pakistan. Israeli officials have said sharp cuts in the Defence Ministry and the close strategic relations with New Delhi had led to a review of its policy of limiting the access of its photoreconnaissance satellite to itself, the Middle East Newsline said in a report. The move, described as an attempt to simplify the visa procedure for foreigners and guarantee the safety of the people, comes in the wake of the Kish Air crash in Sharjah yesterday. At least 12 Indians were among the 43 people killed in the Iranian plane crash. They were returning from Kish Island after renewing or changing their visas to take up jobs in the United Arab Emirates. The collection, which includes a rare 17th century jewelled jade flask expected to fetch around £ 1 million, is being sold by Clive’s descendants. Most of the items have been on display in British museums until recently. In a rare honour, Chairman of the Tata group of companies Ratan Tata was today made honorary economic adviser to the booming east Chinese city of Hangzhou. The title was conferred upon Tata when he called on the mayor of Hangzhou city, Mao Linsheng. 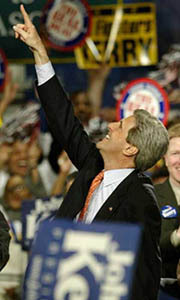 US Democratic presidential candidate and Massachusetts Senator John Kerry points to supporters during a campaign rally at George Mason University in Fairfax, Virginia, on Tuesday. Kerry rolled to dominating wins in Virginia and Tennessee, scoring a southern sweep that could knock out at least one rival and put the nomination within reach.